Rooftop Reviews: Happy Birthday Uncle Irving! Uncle Irving was probably one of the most influential people in my life growing up. His Friday night visits were a welcome break from the daily drudgery of living with 2 over controlling parents. Friday nights were a time when I could go for a walk with him without fear of being questioned when I returned home. He was an oasis to me. In the summer we used to go to the beach at Rockaway every Sunday. In the winter he used to come over and watch football. I have written about all this before; and posted it here. But I can never let his birthday pass without telling his story again. In many ways his was the only unconditional love I have ever known. So, with apologies to those who have read this before, here’s his story. Today would have been my Uncle Irving's 119th birthday; maybe. It might be only his 117th birthday. We'll never know for sure. The Henkins’ were rather secretive about most such things, and so we don't know a whole lot about them. The following is his story as best as we can tell; beginning with how his parents; my great grandparents; Max and Rebecca came to America. It is also the story of how that move eventually affected me through my relationship with their son, a magical man whom I knew as Uncle "I". To leave out the story of his parents would be to leave his own story incomplete; as well as my own. The Henkins’ never were sticklers for the truth- there was no doubt about that. If it was ten men they’d seen, they told it as a hundred; a 20 car freight train was 200 cars long; a five dollar win at the track was fifty. You know the type - colorful and fun to be around. Well, it all started with this horse…. Max “Pops” Henkin (we think that’s the last name- no proof) had a livery stable in the “old" country; a very vague place - somewhere near Kiev in the Ukraine region - some small shetl that, no doubt has long been gone. But it would’ve been nice to know the name. It was there that “Pops”; everyone called him that; met and married Rebecca, and it was there that he operated his livery stable. One day a man came in with a wonderful looking horse, well bred, fed and easily led. This was a mighty steed - 14 hands high, and with a spirited manor. “Pops” could not afford him and so he tried to turn the man away. But this man was persistent and made Max an offer he could not refuse, and so Max became the owner of this prize animal. Accordingly; and expecting a great profit; he put the horse up for sale, advertising it everywhere within a day’s journey of his shetl outside Kiev. All hell broke loose soon after when he was charged with being in possession of a horse belonging to the Czar. He was released pending a trial in which he would have surely been convicted, and so he took his family out of Russia, through Italy and then to Spain and on to probably Canada, although no records seem to exist to support that. And they don’t show up as entering America either, but nevertheless, they were here. “Pops” had 3 children in America with Rebecca. They were Nathan, Isaac and Dora. Isaac was my Grand Uncle through my mom. He and “Pops” had lived with my Mom's family through the World War II years while she was growing up in Brooklyn, NY. He was like a Grandfather to me and no words can express the love I had; and still have; for this man. 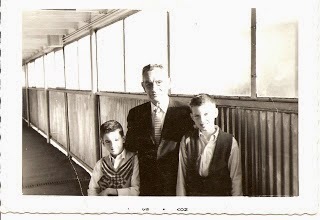 Isaac was later known as Irving – Uncle “I” to my brother and me. Due to the tall tales he told we sometimes called him Uncle “Lie”- but he was always Uncle “I” in my heart. He was born, alternately; depending upon whom you asked; in Vineland, New Jersey; Philadelphia; or New York City. Everyone agrees that it was on Aug 15th- but the year varies- 1893, 1895 or 1898 - take your pick. He was old enough to collect Social Security when I was 5 but worked until a year before he died in 1975. And he was too young to serve in World War I- registering in August of 1918, just 3 months before the Armistice. He probably was trying to avoid detection as an illegal for fear of being sent back to the "old" country. His father had crossed the ocean to escape Europe and Irving had no desire to retrace “Pops” steps – he didn’t want to go back - as either a deportee or a soldier! He worked for the American Railway Express Company and later went into the Garment Industry as a buyer of furs. He used to bring me samples and to this day I can tell real from fake chinchilla, mink, sable, rabbit and even lamb. We had raccoon tails by the armload and attached them to the handlebars of our bikes and the backs of our hats, and even flew one from the antenna of the old Plymouth. When I was younger, he would take me to; and later, when I was older I would meet him at; the furriers where he worked on 7th Avenue in Manhattan. The cutters, the tailors and sewing operators all treated me royally and I was fascinated by this aspect of my Uncle’s life. Although he was already 60 when I was born, for 20 years he took me every Sunday to the beach in the summer, movies in the winter, and ice cream sodas and walks on Friday nights. He always regaled me with the stories of all the people he had met in his business as a furrier and how everyone knew him all over the city. The Friday night walks were the most special times I spent with Uncle “I”. In spite of his age he never failed to make that 1 hour trip each way to watch the news, eat dinner and "talk" a walk with me. By "talk" a walk- I mean that we would talk and walk. We would go to the candy store on Kings Hwy and 15th Street and he would buy me an ice cream soda and afterwards give me a Standing Liberty or Benjamin Franklin half dollar. And when "magic time" was done I would walk him around the corner to the Quentin Road entrance of the BMT for his 1 hour train ride back to Manhattan. They said he had nowhere to go, but I know better- he came to see me. He took me to baseball games at the Polo Grounds, Shea Stadium, and Yankee Stadium; to the circus at the Old Madison Square Garden; and to Radio City Music Hall for the Christmas Shows. He was Jewish to the core, but the blue lit Nativity scene, complete with real camels on stage - made him weep from the majesty of it. He knew every doorman, every usher, and every cabbie. We would go to the Stage Delicatessen on 7th Avenue and he knew all the comedians, actors and characters there, including the owner, Max. We would miss parts of first acts trying to get to our seats as he stopped to acknowledge greeting after greeting, mostly from the people that worked in the places we visited, but sometimes people in the audience would call out to him, as if they desired his recognition, as well as to just say hello. He was a shy and gentle man, yet he seemed well liked and commanded some degree of affection and respect wherever we went. He would go to Las Vegas every year to feed the slots and bring home the old solid silver Morgan Dollars from the 1880’s and the Peace Dollars from the early 1930’s. He never won, but he’d save those last 2 dollars for my brother and I. Occasionally, he would stay over, especially if a game had gone into extra innings or overtime, depending on the season. He would sleep in my bed and I would take a folding cot in between my bed and my brothers. I would cover it with blankets and sheets and get underneath, pretending that this was my submarine. When I emerged I was always confronted by the sight of his teeth in a glass on my desk. I still recall how, at least once every summer at Rockaway Beach, he would duck into a bar for a beer to catch the game and a peek at the baseball score. He didn’t smoke or drink but he would order a beer and bum a cigarette. He’d smoke it without inhaling, enjoying a moment of male camaraderie. It always seemed so mysterious to me, this bachelor world he lived in- hotels and restaurants. It was glamorous on the one hand, and lonely on the other. If I characterize this part of Irving’s’ life as mysterious, it is probably because I never once went up to his hotel room. I suppose he considered it improper or ill advised to take a child up to his room with him. But he gave the most important gift of all to me; his time.